Our Assassin’s Creed 3 walkthrough will guide you through the beginning to ending moments of gameplay with strategy tips for this Open World Action-Adventure on the Xbox 360, PS3, and soon PC & Wii U.
Assassin’s Creed 3 takes you back to the American Revolutionary War, but not the one you’ve read about in history books. Let’s start the Assassin’s Creed 3 walkthrough with an intro video with developer commentary! Please note that viewers must be at least 18 to watch, so no harm comes to those with innocent eyes. This game includes Blood, Intense Violence, Sexual Themes, Strong Language. Update: All Assassin’s Creed 3 walkthrough guides & tips for the DNA Sequences & Missions are live. The American Colonies, 1775. It’s a time of civil unrest and political upheaval in the Americas. As a Native American assassin fights to protect his land and his people, Desmond’s ancestor Connor will ignite the flames of a young nation’s revolution. – The 13 American colonies are about to revolt. You are Connor, an assassin who has sworn to secure liberty for his people and his nation. To do so, you will hunt your enemies across a staggeringly large, open, and realistic world. You will unleash your lethal skills in a violent quest that will take you from chaotic city streets to blood-soaked battlefields in the hostile American wilderness and beyond. Set in Colonial America, the Assassin-Templar war has become involved in the American Revolution. 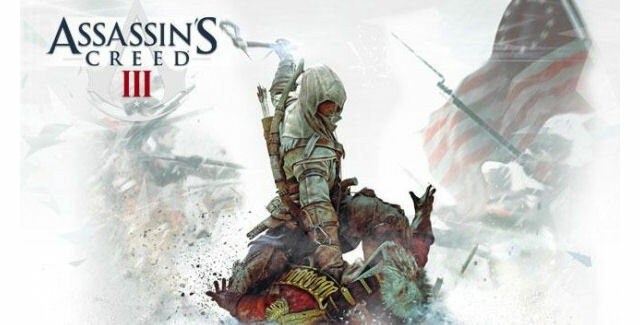 As series’ protagonist Desmond Miles, the player controls a young half-English, half-Native American man named Connor Kenway, drawn into the fight against tyranny when his home is attacked by Colonial British soldiers. Over the course of the game, Kenway will encounter historical figures including George Washington, Benjamin Franklin, Thomas Jefferson, Charles Lee, Israel Putnam, Paul Revere, General Lafayette, John Pitcairn, William Prescott, King George III, Samuel Adams and Friedrich Wilhelm von Steuben. The story will span 30 years of Connor’s life, from 1753 to 1783. Boston and New York will be cities that can be explored, as well as the American Colonial Frontier, spanning forest, cliffs, rivers, Connor’s Mohawk village, and the settlements of Lexington, Concord and Charlestown. It will be open for the player to take part in hunting activities, and approximately one third of the story will take place in the Frontier. The entire Eastern seaboard will also be explorable via Connor captaining a ship. The main portion of the Assassin’s Creed III walkthrough’s story will be set before, during and after the American Revolution from 1753 to 1783, featuring a new protagonist: half-English and half-Native American, Connor Kenway, birth name Ratonhnhaké:ton (pronounced “Ra-doon-ha-gay-doon”). In addition to the historical period, the game will also feature the “present day” setting, where series’ protagonist Desmond Miles must endeavour to prevent the 2012 apocalypse, as his story will develop and then reach a conclusion. Players will also experience more Desmond than in any previous titles. The game features a new engine, Anvil Next, built from the ground up, the engine is said to utilise full capability of current generation systems to deliver a “next-gen” Assassin’s Creed experience. A New Master Assassin – As Connor, a Native American Assassin, unleash your predatory instincts to stalk your enemies and devastate them with new weapons including tomahawks, rope darts, bows, guns/firearms and more. Centuries before the term “black ops” is defined, you will pioneer this new kind of warfare. Whether you use your predatory instincts to kill silently, or your fearsome arsenal to kill openly, one thing is clear: the world that the Assassins live in has become far more deadly. And so have you. Ignite The Fires Of Revolution – Fighting from Lexington and Concord, the Battle of Bunker Hill to the Great Fire of New York, you are America’s first highly trained Master Assassin. Play a critical role in the most legendary events of the American Revolution. Incite the revolution by working behind the scenes along with historical icons like George Washington, Benjamin Franklin and more. Together you will conspire to annihilate those who threaten Liberty itself. Explore A Brave New World – Pursue your enemies through massive environments, from bustling city streets to blood-soaked chaotic battlefields, and into the far reaches of the American frontier. From Boston and New York, to the snow-covered Appalachian wilderness. Experience the truth behind the most gruesome war in history: the American Revolution. Brand New Naval Warfare – In Assassin’s Creed III Connor will battle his enemies not only on land, but also on the High Seas aboard his stalwart vessel, The Aquila. You’ll navigate tumultuous waters and command your own naval warship, sending enemies to their watery graves with cannons and an array of powerful naval weaponry. Or should you choose, ready a boarding party and take the fight to the enemy by battling hand-to-hand on the deck of their own ship. Stunning New Engine – Experience the power of Anvil Next, Ubisoft’s new game engine designed for Assassin’s Creed III. Revolutionary advanced physics, lifelike animation (more than 1,000 new animations for Connor alone!) and weather systems deliver unprecedented realism, while a whole-new immersive combat system delivers more intense, gut-wrenching battles than ever before (as thousands can engage in battle!). Breakthroughs in motion-capture, animation, and AI technology are all part of making the game deliver more realistic character animations and interactions. How to get rid of Orphans? Don’t worry, I’m not going to recommend you kill orphan kids to get rid of them. Aside from it being against the Assassins code, as we all know killing civilians will result in the game desynchronizing – going Game Over – forcing you to replay the mission you’re on. Here’s an easy way to get rid of Orphans: Giggling Orphans will attract attention and slow your movement by crowding you as you travel the city. Give them a few coins to continue undisturbed. Also, when possible, you can travel via the city’s rooftops as to not be bothered by them. Are there many story-related Achievements / Trophies? As you progress through the single player story campaign, you’ll receive Achievements / Trophies for completing DNA Sequences 1-12, Desmond Sequences 1-4 and the Epilogue Missions. “Introduction” — In the introduction cinematic you get a recap of Desmond’s adventures from Assassin’s Creed 1 & 2 up to Assassin’s Creed: Brotherhood & Revelations, leading up to the start of Assassin’s Creed 3. “Prologue: Refresher Course” — Let’s get this Assassin’s Creed 3 walkthrough started by going over the movement basics as Desmond enters the Animus. Prologue “Refresher Course” Objective: Synchronize with your ancestor. Full Synchronization: Perform an Air Assassination. Replaying Missions Tip: You can use the DNA Tracker menu to retry this mission and achieve full synchronization. “Sequence 01: Journey To The New World” — The First Civilization has led Desmond Miles and his allies here in order to prevent a massive solar flare that threatens all life on the planet. Now they just need to figure out how to do it. Desmond’s ancestral memories appear to hold the answer. Sequence 1 includes missions in the Theatre Royal, Coven Garden (1754) and aboard the ship, The Providence to travel the Atlantic Ocean from Great Britain to America. Mission 1 “A Deadly Performance” Objective: Assassinate the target at the Royal Opera House. Location: Theater Royal, Covent Garden 1754. Mission 2 “Journey To The New World” Objective: Journey from London to Boston aboard the Providence. • Completed all the constraints in one playthrough. To clarify: You start the game as Connor’s father Haytham Kenway in the Theatre Royal. In part 2 of Sequence 1, we have more adventures aboard The Providence ship. In part 3 of Sequence 1, we find out who is sabotaging us, enter a storm, and we might arrive in Boston, Massachusetts. Hiding Places Tip: Certain objects such as haystacks can be used to hide. Interact or move toward them to become invisible. Viewpoints Tip: Be sure to seek out Viewpoints in each area, indicated by an eagle symbol on your map, to clear the fog from the map for a clear view and open up new objectives. You’ll be told to press the Synchronize button once you reach the top of a building to get a beautiful 360 degrees view of the city area you’re in. Instead of climbing all the way down again, be sure to look down to the foot of the building you’re on to find stacks of hay to do a Leap Of Faith into (press the forward walk and Action trigger to perform this move safely or you’ll just fall to your death) for a fast jump down to the ground. Faster Traveling Via Horse Tip: Use your whistle to call your horse to where you are. It’s much faster than you walking/running, even quicker is to press the Action button while galloping to spur your horse to start sprinting! – But remember, sprinting with a horse depletes its stamina. Stop sprinting to let it replenish over time. Guard Dog & Treasure Hint: Guard dogs have keen senses. If they can detect you, they will alert the guard. So stay clear of them. – However, where there are guard dogs there’s often a treasure nearby. If that’s the case, they kill the guard dog with your hidden blade to safely open the treasure chest. Chests are scattered throughout the world, pick their locks to acquire their contents. Assassin’s Creed 3 Walkthrough continues on Page 2 with Sequence 2.